**PRIME RIB EVERY NIGHT AND LEG OF LAMB ALL DAY** - We're serving delicious all you care to eat Leg of Lamb for lunch and dinner and Prime Rib, which we carve English style Monday through Saturday starting at dinner and all day Sunday starting at 11 AM. 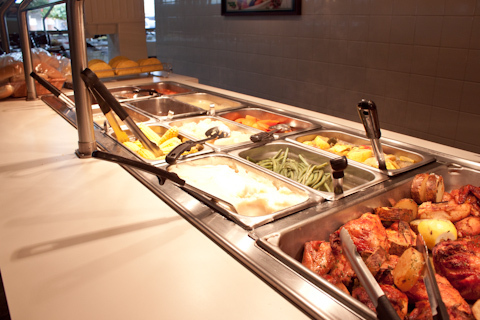 We serve delicious home-style food in a buffet format. 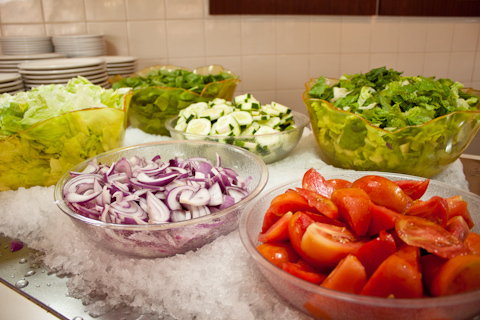 Our salad bar is garden fresh and our hot food selections are made from scratch every day. 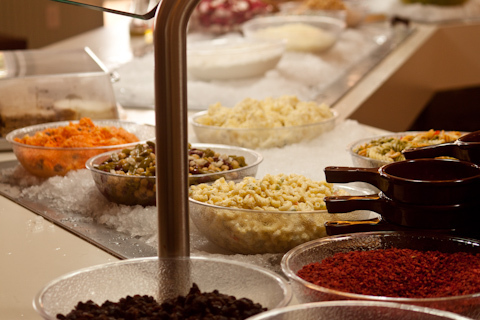 Included in the buffet is a wide variety of fresh hot and cold foods and fresh baked desserts (for an extra charge). Come enjoy a delicious homestyle meal served in a warm, friendly atmosphere. We think you will be impressed with our great service and really good food. Short lunch break? You've come to the right place! 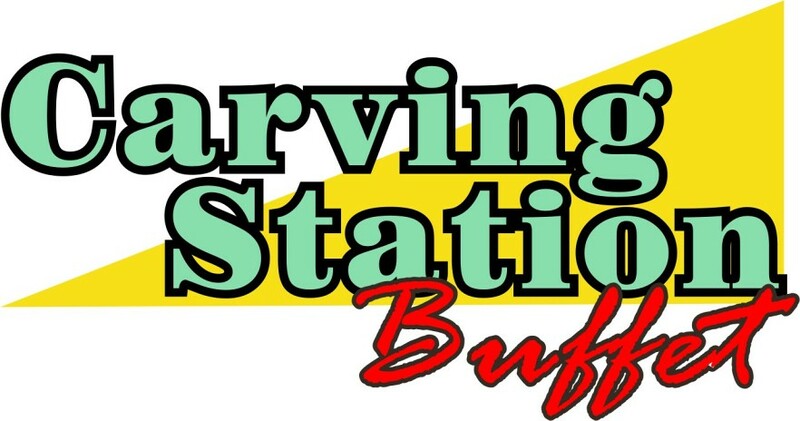 Walk in, start at the buffet, enjoy a great tasting meal and be out the door in 15 minutes or less! At lunch enjoy our soup and salad or our full buffet. At lunch and dinner we serve two soups, fresh-carved roast turkey and stuffing, baked ham, roast beef, delicious fried chicken (NO trans fats), baked tilapia fish fillet, baked chicken, chicken breast français, macaroni and cheese, pasta dishes, hot vegetables, and many other delicious hot and cold foods. At dinner we serve delicious Prime Rib seven days a week. Specials such as jumbo fried shrimp, barbeque pork spare ribs and our legendary corned beef make regular appearances. Click Here to check out when our specials are offered. The Palm Beach Post named our restaurant the best dining value in the county. Only one restaurant a year is given that recognition. That explains why we have so many repeat customers. 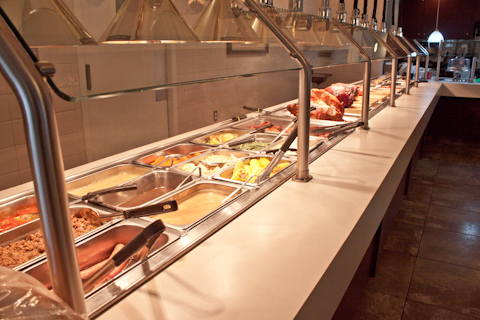 Give our made-from-scratch, fresh American-style buffet a try. We think you will truly be amazed at how good it is! TAKEOUTS - Fixed price NOT per pound. You receive two food containers and one meat portion. Extra meat and dessert are available for an extra charge. You can also buy whole cakes and pies to go. CATERING - We have extensive and very reasonably priced catering capabilities. Please call Spiros at (561) 758-4623 to help plan your next catering event. GIFT CARDS - Any denomination ($20 minimum) with no expiration date. Comes with a presentation card and envelope.